It's no wonder that The Power of Now has sold over 2 million copies worldwide and has been translated into over 30 foreign languages. Much more than simple principles and platitudes, the book takes readers on an inspiring spiritual journey to find their true and deepest self and reach the ultimate in personal growth and spirituality: the discovery of truth and light. In the first chapter, Tolle introduces readers to enlightenment and its natural enemy, the mind. He awakens readers to their role as a creator of pain and shows them how to have a pain-free identity by living fully in the present. The journey is thrilling, and along the way, the author shows how to connect to the indestructible essence of our Being, "the eternal, ever-present One Life beyond the myriad forms of life that are subject to birth and death." 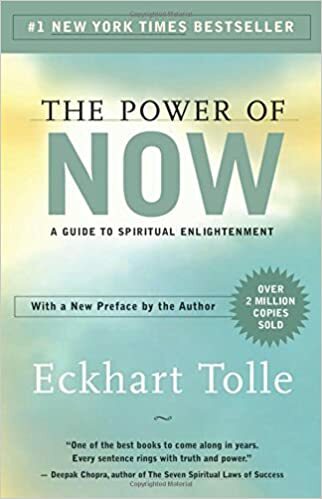 Featuring a new preface by the author, this paperback shows that only after regaining awareness of Being, liberated from Mind and intensely in the Now, is there Enlightenment. One way I have come to accept and stop fearing death is to realize that all the things I am afraid of happening when I die I will not experience, because I will be dead. I will not be sad that I can't see my friends anymore, because there will be no me to be sad. I will not be angry or frightened or hurt, because there will be no me to feel these things. This is really a blessing: all those negative and painful experiences? We get to avoid them. You may be going through your life and suddenly you will think, "What if I die today?" and get anxious. And that's okay! Simply answer your own question: "What if I die today? Well, I'll be dead. And I won't have to deal with any of the fallout." I don't think it's really death that's causing you so much grief: it's the fact that you're dwelling on it, especially when that isn't going to change anything. Right now, though, you're neither dead nor dying. Right now you're just fine. And you only ever experience right now. And when death does happen in the right now, you won't experience it, because you'll be dead. Nothing much to worry about there. =) I recommend the book The Power of Now by Eckhart Tolle to help you stop dwelling on things that aren't actually happening, like death. I saw another redditor recommend it in this subreddit years ago (and many continue to do so), and it was extremely helpful for me when I started really trying to beat my anxiety. Finally, I would like to point out that you posted three paragraphs about death. And you survived! Look how strong you are! You directly addressed your fear—and I'm certain you felt better afterwards, even if you weren't completely, 100% happy. This, that resistance never goes away, but your attitude towards it completely shifts with enough right action.